Seated behind his piano on the Grand Ole Opry stage, the wildman of rock’n’roll wasn’t holding back.“Let me tell ya something about Jerry Lee Lewis, ladies and gentlemen,” he announced. “I am a rock and rollin’, country-and-western, rhythm and blues-singin’ motherf***er!” It was a watershed moment in his career, and a dominant display now deeply ingrained in the folklore of the world-famous country institution. 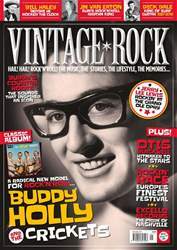 New issue of Vintage Rock is available now! WHOLE LOTTA DRUMMIN’ GOIN’ ON! BILL HALEY BEFORE THE BIG BANG!